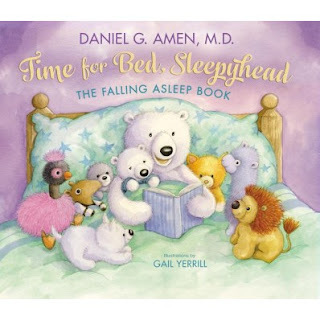 Book Review: "Time for Bed Sleepyhead"
This cute animal story has very whimsical and love-able friends throughout! Some of the animals almost have a stuffed animal type of look to them which makes you fall in love with them so much more. This book even has a line that reminds parents of a discussion to have with your kids, "Do I have to go to bed, Momma?" Little Bear Asked," "Oh, yes! Sleep is very important. In fact it's one of the most important things you'll ever do!" I must be one blessed mom because for the most part my kids go to sleep in the evenings fairly well. I know some parents who struggle every night to get their beauties to sleep. I can't promise that this story will get them to fall asleep but I can tell you that if you pause after the above line and talk about how important it is too sleep you might have some children re thinking their schemes for staying up the extra few minutes. Sleep is when our bodies grow, sleep is when our body heals, God told us we need to rest! So make sure you take some time to help teach your children the reason we need to sleep to help them understand what their body needs.